The rugged and compact Log Mate 500 is built from high quality components. By developing a highly advanced control system specially for Log Max heads, Log Mate 500 becomes the perfect match for getting the most out of all Log Max products and accessories. 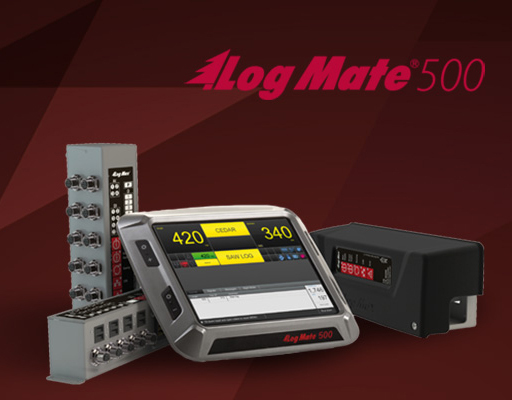 Running features such as Active Friction Control and Four Point Measuring natively on Log Mate or having the ability to test and control all I/O are just some of a long list of features Log Mate 500 has to offer. Built using rugged hardware the Log Mate 500 will withstand rough outdoor environment. The computer is IP65 standard compliant and has a Solid State Drive eliminating moving parts. The brand new communication modules are all built according to the tough IP standards. Log Mate 500 works together with the new StanForD 2010 forest standards. One module is mounted on the head, two in the cabin to transfer and receive data and power to the harvesting head. They all feature standard M12 and Deutsch contacts. All communications are made over a two channel CANbus system. As the computer is Windows based it allows the operator to install programs for example GPS and internet connection. Thanks to the system being Windows based it makes it easier to administrate and update/upgrade the Log Mate 500 system. AfrEquip (Pty) Ltd is a forward-thinking company that aims to provide role players in the South African Forestry Industry with modern mobile equipment that out-performs all others. Afrequip Copyright © 2019. All rights reserved.